This rasp has been the subject of articles in The New York Times, the Chicago Tribune, the Los Angeles Times, The Globe and Mail (Toronto), and dozens of other newspapers. It can be seen regularly on TV cooking shows and is enthusiastically praised by leading chefs. For a tool that started life as a lowly wood rasp, this is high living. Fame in the food world came about when a Lee Valley woodworker’s wife discovered that her husband’s new wood rasp would zest oranges. This discovery rapidly led to expanded uses such as zesting lemons, grating nuts and ginger, reducing a clove of garlic to near liquid in seconds, etc. The single most spectacular and practical use was with hard cheese for use on pasta or in salads. Because it actually cuts the cheese into gossamer-thin shavings rather than grating it into small chunks, it is possible to use much less cheese for equivalent flavor impact when compared with grated cheese. 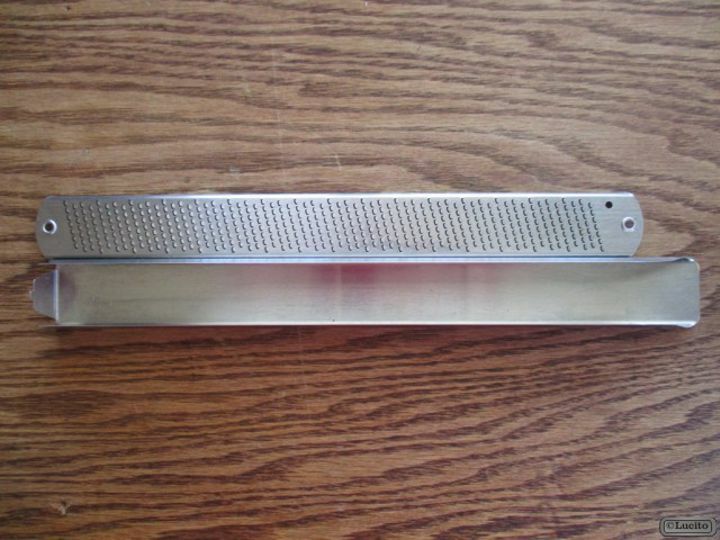 Rasp is stainless steel, 12″ long. All of this utility has been enhanced by our patented design of a stainless-steel base that makes the rasp easier to hold and also contains the zested material. Rasp made in USA, zester holder made in Canada.